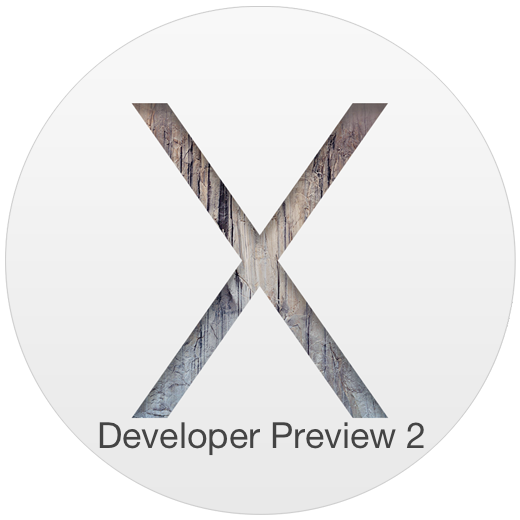 Apple has released OS X Yosemite Developer Preview 2 to Mac users running OS X 10.10 beta builds. The new build includes many bug fixes, feature enhancements, and additions to the beta release of OS X, and arrives versioned as 14A261i. The updated build is available to download through the Mac App Store, and Mac developers can log into the Mac Dev Center to find a promo code. Those registered with both developer programs from Apple will also find iOS 8 beta 2 to be available. These early OS X Yosemite Developer Preview builds are incomplete and fairly buggy, intended for developers to build and update applications and services for. Installing it on a primary Mac is generally not advised unless Yosemite is installed on a separate partition to keep it away from the primary stable OS X version on the computer. Users can also choose to install OS X 10.10 onto a USB drive or other external volume if desired. Users who are interested in running beta builds of the next major release of Mac OS X software can sign up for the official OS X Yosemite beta test program through Apple. The first public beta seed is expected to be pushed out early in the summer. OS X 10.10 Yosemite offers a significant visual overhaul to the Mac operating system as well as many new features. The final public release of OS X Yosemite is expected this fall, possibly alongside iOS 8 and many updates to Apple’s hardware lineup. Dark Mode is partially included in OS X Yosemite DP2, must use a defaults command and it’s only partially working, not everything there yet. So far it only changes the Dock and menu bar, here’s to hoping it changes the windows and all other UI elements in OS X Yosemite as well. Mail still completely dysfunctional using IMAP. Do you mean Gmail? Gmail does not follow a standard IMAP protocol. I was hoping that Apple would work on some optimization but they just keep adding more things that I could care less about. Now Yosemite consumes all my memory. Hopefully something changes before the final release. I was able to look past the new ugly Linux interface but the lack of optimizations just doesn’t cut it. Snow Leopard is still Apple’s best OS. How much RAM do you have? And what is the percentage? I was wondering if this was going to become a resource hog. I have a 2010 11″ MacBook Air with 2GB of memory. Mavericks wasn’t too bad but did consume a lot of the memory. Yosemite is now consuming 1.99GB with nothing running except Activity Monitor. Like I said though, hopefully this changes before the final release. 2GB was just fine on Mavericks for me and I render animations, programming, and so on. Also, you can not upgrade your memory on a MacBook Air. 2GB is way too low to run anything these days. I’m a SysAdmin for the company I work for. The bare minimal any Mac can work under these days is 4GB and not well at that. NO amount of optimizations Apple does will change this. Currently your 2GB Mac is having to cache out everything to the HD. This puts excessive stress on the HD, causing major slow down Eventually the Harddrive will fail, probably a lot sooner than you would think. Add the memory, you will see a major performance jump. You won’t regret it. I installed Yosemite on my primary Mac and I’m beginning to regret it. The ‘Optimising Your Mac’ notification has been on my screen for a few days now, making the computer really, really slow. Mail is unstable, falling twice a day and unable to attach big documents to messages. MacPorts is not ready for Yosemite too. I hope it will be on time for release somewhen in the future. My advice it to wait for the official release. I agree, Yosemite is not stable enough to be the primary operating system yet, it’s really best used on a secondary Mac or secondary partition. The final version in the fall will be a lot better.